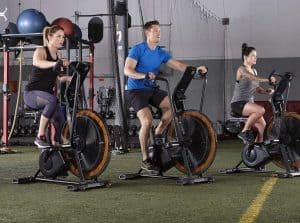 The Octane Fitness AirDyneX Fan Bike is a commercial quality bike with 26-blade performance fan that delivers the perfect resistance for HIIT training. This bike brings to mind the Schwinn AD7 Airdyne Exercise Bike and the Schwinn Airdyne Pro Exercise Bike because they look alike and share a lot in common in terms of features. This is the home trainer that offers the possibility of achieving maximum result out of a minimum workout. Its big 26-blade fan ensures that you get the resistance that is equal to your fitness level because resistance is generated according to your workout intensity. Individuals seeking to experience maximum and difficult workouts will certainly get what they wish for with the Octane Fitness AirDyneX Fan Bike and burn twice the calories that could have been burned with the regular spin or upright bike in the same amount of workout duration. Differently put, folks that can’t get enough resistance while using other indoor cycling bikes, this will be the perfect choice for them because the resistance generated is proportionate to the user’s speed and effort. In other words, the faster you pedal the more resistance you are likely to encounter, very dynamic. Click right here to have a peek at the discounted price of the Octane Fitness AirDyneX Fan Bike on Amazon. Octane Fitness AirDyneX Fan Bike is sturdily built with heavy duty steel tubing that supports a high user weight capacity of 350 pounds/158.7 kg. This is simply a testament that the bike is ruggedly built with commercial grade and quality. 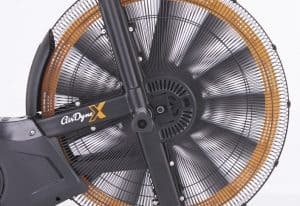 The 26-blade fan has a trademark color of orange at the tip of each blade giving it a unique look from the Schwinn AirDyne Bike. It is not a very large machine; it has overall dimensions of 55 inches long by 26 inches wide by 53 inches tall. This means that the workout area that will be required for the AirdynX is 4.6 feet long by 2.2 feet wide and at least a ceiling height of 7 feet. However, 2 feet of extra clearance should be added on the rear and on each side of the bike for safe and convenient workouts. It is a very stable bike that does not wobble or tilt in any form due to its base framework that is integrated with solid steel stabilizer bars. There are also four adjustable levelers underneath the stabilizer bars which further boost stability on the face of an uneven surface. It weighs about 113 pounds/51 kg which advantageously grounds and stabilizes the bike even further; although, some people may have the concern of how to relocate the bike from one location to another due to its weight, but the good news is that there are two transport wheels at the front base that completely make the bike portable. Just like the Schwinn AirDyne Pro, the Octane Fitness AirDyneX Fan Bike is integrated with the triple sided anti-skid resting pads which allow you to perform the upper body workouts without having to pedal. This feature is not common on most Air fan bikes only on few such as these bikes. The seat on the Octane Fitness AirDyneX Fan Bike is larger than most of the ones found on spin bikes and it is padded with a form to convey comfort. The material used for the covering of the seat is a vinyl material that is durable enough to last longer. It is also a 4-way adjustable seat, i.e. can be adjusted vertically (upward/downward) and horizontally (fore/aft). It has multiple adjustment options to accommodate users of different heights and sizes comfortably. Due to these adjustments, users between the heights of 5 to 6.5 feet can easily find a suitable position for exciting workouts. 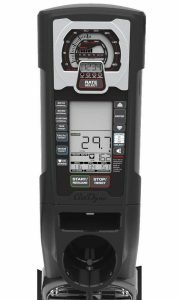 It provides biomechanically correct positioning that delivers proper knee placement for maximum engagement with every pedal stroke for outstanding effectiveness. If by any reason you feel that the saddle is not soft or comfortable enough you can use the gel seat cover to improve on that. The adjustment of the seat doesn’t take time; it takes only seconds to set it to a suitable position. The bike obviously has mobile handlebars that essentially allow you to exercise the upper body. This is an additional advantage of this bike because not many upright bikes have this feature. These handlebars allow you to exercise the shoulders, the back, the arm, and the core. Due to the fact that the handlebars are connected to the pulley they work together with the pedals; i.e. as long as the pedals spin they move as well, they are not independent and that is the reason why the foot pads are included to allow you to rest your foot while you work out the upper body independently. The handlebars are multi-grip designed intended to allow you to workout in different postures that consequently impact certain muscle groups. They are coated with a rubber foam material that provides maximum comfort that also prevents slippage and blister in the palms. The pedals are durable, made of metallic alloy and featuring a standard thread. This means they can be replaced with another set of pedals of your choice. They are strong enough to support the maximum capacity user weight at stand up pedaling. They don’t feature SDP clips and as a result, cannot be used with spin shoes. However, they have toe cages that allow a user to workout with extra thrust and safety. The Octane Fitness AirDyneX Fan Bike features a single-stage belt drive system that leverages every bit of your effort to generate resistance. Ordinarily, the belt drive system is usually quiet and smooth during operation, but in this case, due to the fan, the bike is not entirely very quiet. Differently put, the belt drive is quiet compared to a chain driven bike but there is still swoosh noise that comes from the fan. Even at that, noise from the fan is not enough to prevent you from listening to music or watching your favorite TV show. Basically, you will still experience a smooth and quiet drive as you workout. The drive also consists of elements such as the crankset, pulleys, the fan, and the crank arms; and the crankset and the crank arms are rugged and sturdy enough to withstand any sort of hard us. 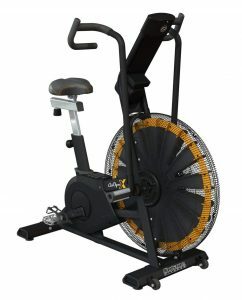 The air bike’s resistance is such a unique resistance system that generates resistance proportionately as the user pedals and that is the type of resistance system that the Octane Fitness AirdyneX Fan Bike possesses. 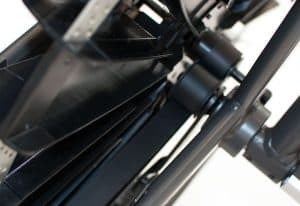 The Octane’s resistance is considered unique and highly challenging because it generates more powerful resistance than most air bikes can generate due to its 26 large fan blades. This bike is suitable for any user at any fitness level. It won’t be too difficult for beginners and neither is it going to be too easy for advanced athletes. Basically, the user determines how difficult and how easy the workout can get. The faster you pedal the harder the resistance gets and the slower you pedal the easier the resistance gets. It has no pre-determined resistance levels just as the case with a magnetic resistance system. It is simply a dynamic resistance system that provides users with the proportionate level of resistance suitable for their fitness level. The console on the Octane Fitness AirDyneX Fan Bike has outstanding and advanced features that make the user’s workout fun and productive. One of the several unique features of the console is the tachometer that signals how hard the user is exercising and provides the average calories burn per minute. This feature basically motivates users to push harder in order to achieve a greater result. The console is simple and intuitive to navigate and the digital display delivers essential statistics within users’ reach. A user can simply get into a program at the push of a button; it displays data such as the RPM, distance, watts, speed, heart rate, and calories burned. There are three main intervals the console offers which are the 20/10 interval, 30/90 interval, and the custom interval which allows you to determine and create your preferred unique interval workout. You can also set up a target goal for time, calories, and distance which give you a sense of responsibility and fulfillment when you are able to reach the targets. There also three heart rate intervals for 65%, 75%, and 85%. The console is telemetry enabled, which simply means that you can use an uncoded HR chest strap such as the Polar Electro or any uncoded polar compatible type to connect to the console wireless in order to read the heart rate and transmit it to the monitor. The console has a calibration feature that automatically calibrates the resistance output for differences in air pressure via the built-in pressure sensor. For accurate readings, the calibration system calculates the resistance for differences in belt tension and bearing friction. The console is powered by 2 D batteries which are included. The console is not compatible with any online fitness app. The Octane Fitness AirDyneX Fan Bike is not foldable but neither is it a very large machine that will require a large space for storage. The overall dimensions are 55 inches long by 26 inches wide by 53 inches tall. Basically, a storage space of 4.5 feet long by 2.1 feet wide will suffice. It is portable with transport wheels at the front base which allows a user to easily move it from one location to another. The Octane Fitness AirDyneX Fan Bike has a water bottle holder as an accessory. It does not have a tablet holder or even a fan. However, you can choose to use an AirDyne Air Diverter accessory which will be attached to the fan so that the air current generated from the fan will be diverted to you to serve as a cooling fan. The Octane Fitness AirDyneX Fan Bike only has fewer Amazon customer reviews at the time of this review. That said, it has a 4.6 start out of 5 stars approval rating. This shows that every single Amazon reviewer is satisfied with the bike and recommends it. The Octane Fitness AirDyneX Fan Bike is shipped in a box with dimensions of 54 inches long by 34 inches wide by 15 inches tall. It has a shipping weight of 132 pounds/59.8 kg. The cost of the shipping is solely determined by the vendor that is selling to you. Amazon provides free shipping to the United States residents and delivers within days of order. The assembly of the Octane Fitness AirDyneX Fan Bike is not difficult and won’t take much time to completely put together. 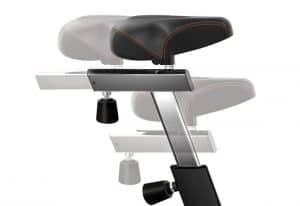 This is so because it is delivered with the major components preassembled and there are only parts such as the seat post, the seat, the mobile arms, the stabilizer bars, the pedals, and the console to be attached to the frame. An instruction manual is included in the package which will direct on the steps to successfully assemble the machine. The required tools for the assembly are also included as well. The Octane Fitness AirDyneX Fan Bike does not require any major maintenance because it has a belt drive system that doesn’t need any. You are only expected to always examine the bike for any damage and repairs in order to prevent an accident and further damage to the bike and also Keep the bike clean from dirt and sweat at all times. 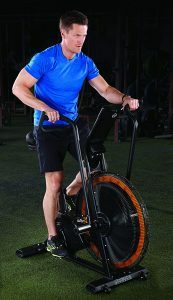 The Octane Fitness AirDyneX Fan Bike is no doubt a very sturdy and stable bike that has all the necessary features that could help you realize your fitness goals as you enjoy every bit of your workouts.